Catalonia's President Carles Puigdemont said that Catalonia will proclaim the region's independence from Spain within several days. MOSCOW (Sputnik) — Catalonia will proclaim the region's independence from Spain within several days, Catalonia's President Carles Puigdemont told the BBC broadcaster. According to Puigdemont, the Catalan government will "act at the end of this week or the beginning of next." 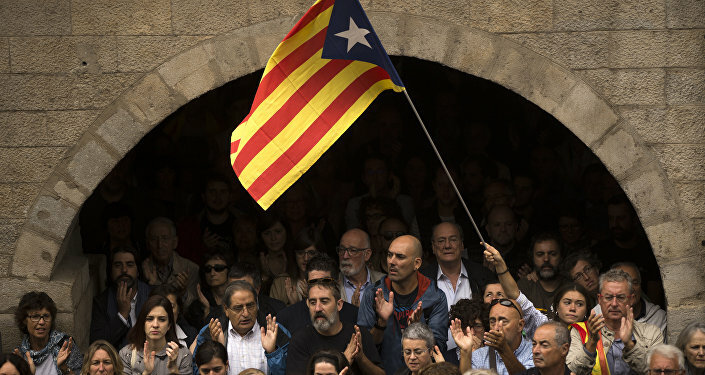 On Sunday, Catalonia held the referendum on independence from Spain. According to the Catalan authorities, over 90 percent of more than 2.26 million voters, who took part in the referendum, supported the region's independence. Madrid did not recognize the legitimacy of the vote, sending police to Catalonia to shut down polling stations, which resulted in clashes with voters. The Catalan Health Department said that nearly 1,000 people sought medical help after the clashes. Prime Minister of Spain Mariano Rajoy said that in Catalonia there was "no referendum" on self-determination, but assured that the government was ready to conduct a dialogue within the regional authorities. Several world leaders have supported Madrid after the referendum. The French Foreign Ministry said Monday that Paris supported Spain's unity and integrity, adding that Paris was confident in Spain’s democratic ability to hold a peaceful political dialogue within constitutional law. The Mexican Foreign Ministry also said that Mexico supported the unity of Spain and the rule of law in the country amid the disputes caused by the referendum.